FAYETTEVILLE -- Fayetteville police are searching for the man they said impersonated a police officer and sexually assaulted a Fort Bragg soldier's daughter. Detectives said the assault happened around 6 p.m. Wednesday on Bragg Boulevard somewhere between the city limits of Fayetteville and Spring Lake. The victim told police she was travelling from Fayetteville when she was stopped by a car that was tan or gold, had four doors, and a blue light on the dash. She described it as an unmarked police car. The victim said the suspect approached her and asked her for her driver's license and registration, and told her he had stopped her for speeding. Police said the suspect made the victim get out of her car and forced her to the nearby woods where he sexually assaulted her. The suspect then allowed the victim to leave. The suspect is described at a white male, clean shaven, around 5 feet 7 inches tall, with medium build. The victim said he is in his late 20s to early 30s. He was reportedly wearing black or dark pants with a burgundy stripe down the legs, and a gray button up short-sleeve shirt with a collar. 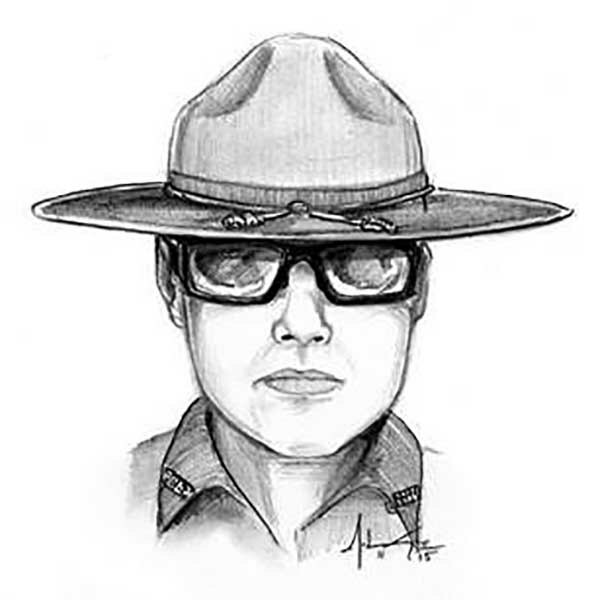 The victim said he was wearing aviators and a "Smokey Bear" type hat. She said even though he did not have a badge or a name plate on his shirt, he did have a pistol in a holster hanging from his pants. Anyone with information regarding the sexual assault is asked to contact the U.S. Army Criminal Investigation Command at Ft. Bragg at (910) 635-1758, citizens may also email Army CID Crime Tips at: usarmy.belvoir.usacidc.mail.crime-tips@mail.mil or call 1-844-ARMY-CID. Additionally, anyone with information can contact FPD Detective Benazzi at (910) 257-3668, or Crimestoppers at (910) 483-TIPS (8477). Crimestoppers information can also be submitted electronically, by visiting http://fay-nccrimestoppers.org and completing the anonymous online tip sheet or by text-a-tip on your mobile device by sending a message to 274637 (in the text box type "4Tip" followed by your message). The Fayetteville Police Department and Army CID would like to notify our citizens that if an un-marked vehicle attempts to stop you, and you have a valid reason to question whether it is a real law enforcement officer or not, immediately slow down just under the posted speed limit, move into the right hand travel lane, turn on your emergency flashers, continue driving to a well-lit location with people around, obeying all traffic laws, and call 911 to confirm that it is a law enforcement officer behind you.